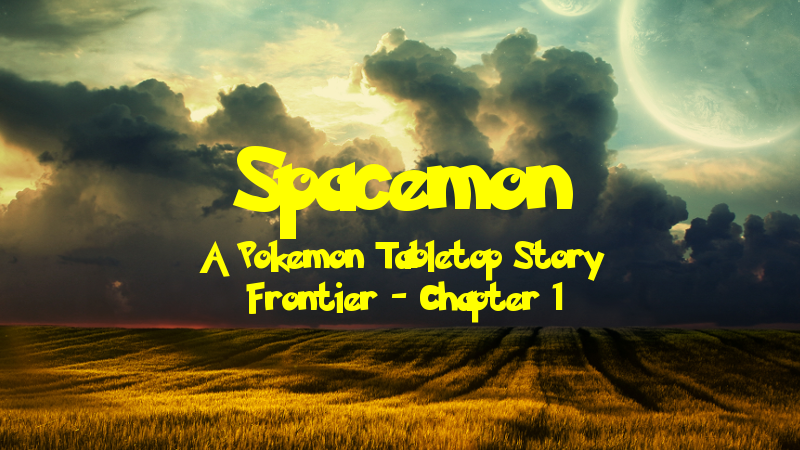 Welcome to the beginning of a brand new saga of Spacemon, the tale of a Pokemon TRPG campaign! This is a spinoff of the sci-fi space epic played using the Pokemon Tabletop United (PTU) system, this time GMed by yours truly. You can get caught up the entire Spacemon saga here! “How thoughtful of you,” the Alliance mercenary grumbled. He hefted up his flamethrower and took a step through the entrance to the ruins that the Maverick crew was gathered around. “Don’t say I never did nothin’ for ya,” Cyrus chuckled as he followed Axel into the dimly lit passageway. The crew proceeded further into the ruin, passing through columns of light flittering down through the holes in the ceiling. “Hopefully we find something this time,” Erik Virtanen, the Maverick’s engineer, commented as they continued. “I’m sure we’ll discover something that benefits us all,” the monk, Taraka Bhaluka, replied. “And what makes you so sure of that, pal?” Cyrus asked. “Just a gut feeling,” Taraka answered. Cyrus still wasn’t quite sure what to make of the Sinai monk. They had picked him up only a few days ago on Paso. He was actually the reason they had come this far out on the Rim. Taraka was on his pilgrimage, a rite of passage for Sinai monks that Cyrus only had a vague understanding of, and his journey had pointed him to this uncharted world. Unfortunately the monk had depleted his funds and wasn’t able to find passage. Cyrus had taken pity on the man, and worked out a special arrangement. In exchange for transport for the duration of his pilgrimage, Taraka had offered to work for the captain, providing both extra labour and his healing skills. Credits were a bit sparse at the moment, so it was a beneficial arrangement for both parties. And so, the Maverick crew now found themselves exploring an ancient ruin in the far reaches of Sector 34. Taraka believed a clue that would help unlock the purpose of his pilgrimage lay within, and for the others it was another routine salvage operation. Cyrus and company were no strangers to exploring old ruins, searching for valuable technology and useful scraps. As they continued deeper into the ruin, the outside light grew dimmer due to the structure being much more intact. However, it was still bright enough to see thanks to rune-like inscriptions glowing along the ancient metal walls. To Cyrus, it almost felt like the runes were guiding them down the corridor. “You would think anything this old wouldn’t be functional anymore,” Erik said. “I like the sound of that,” Axel said, picking up his pace a little. As his crew fanned out, Cyrus began poking around a scrap pile sitting atop a large slab. The contents appeared to be broken and corroded robotic parts. Cyrus pulled an arm out of the pile and gave it a quick once over. It was surprisingly light compared to anything he had seen before. “Hey, Erik, what do you make of this?” the captain called his engineer over. “So this stuff could be worth a lot of money?” Cyrus asked. Over the next several minutes, the crew gathered up all the robotic parts in the room and loaded them into the two large antigrav-repulsor-mounted salvage crates they brought from the ship. As they were finishing up, Cyrus noticed a strange expression appear on Taraka’s face. “Everything alright there?” the captain asked the monk. “It was probably just the wind blowing in through the holes back in the corridor,” Axel dismissed him. “Axel, come and give me a hand with this,” Cyrus said, approaching the panel. “Oh, alright,” the mercenary replied unenthusiastically. Together, the two men pushed the panel aside revealing a dark passageway. Suddenly, a large swarm of Zubats came flying out of the darkness, several of them crashing right into Cyrus and Axel. Thinking quickly, Cyrus reached for a Pokeball and released his Talonflame. “Peregrine, Flame Charge!” the captain commanded his Pokemon. The swift bird surrounded itself in flames as it flew at the swarming Zubats. Spooked, the cluster of Pokemon fled out of the room, down the corridor the crew had entered from. Cyrus’s Pokemon let out a fierce cry, then flew back to his trainer and perched upon his shoulder. “Everyone alright?” Cyrus asked, turning his attention to his crew. “Sounds like a plan,” Cyrus agreed. “Now, let’s see where this passageway leads.” He took a step into the corridor the Zubats had emerged from, and his crew fell in line behind him. After several minutes of walking, the crew arrived in another room, or at least half of one; a large cave-in prevented them from advancing any further. “Well, this was a waste of time,” Axel grumbled. “Hold on a minute,” Taraka responded. “I sense something here. Something feels …” The monk trailed off as his eyes slowly glazed over. “You alright there, Taraka?” Cyrus asked. The monk didn’t answer. He simply stood there, motionless. Several moments passed, and Cyrus was beginning to get concerned, but, suddenly, Taraka looked around at everyone, a normal expression having returned to his face. “What the hell was that about?” Axel asked. “It was a vision,” Taraka explained. “I’m not sure. But there’s something …” Taraka began running his hand along the wall, as if he was searching for something. “Aha!” The monk pressed his hand against the wall, depressing a small panel. In response, the wall panel slid away, revealing another room. “Well, let’s see what’s inside, shall we?” Cyrus stepped into the room, and took a look around. In the middle of the room sat what appeared to be some sort of pod, its metal frame broken in several places. Despite the holes, it was impossible to determine if anything was contained within in the dim light. Remnants of wires and cables lay across the floor, some still connected to the pod. Cyrus and Axel gripped one of the panels on the pod using the holes in its surface and slowly pried it off. Inside the pod stood an artificial humanoid figure. It was badly damaged and missing several components, but it was still clear what it was. “Alright, let’s see what we’ve got here,” Erik said to no one in particular. Back in his workshop aboard the Maverick, the Genevan engineer looked down at the robotic construct lying on the table. Despite its badly damaged state, Erik was in awe of its design. It was far beyond any current Human technology. What I would give to know more about the civilization that created this, he thought as he moved in closer to examine the crew’s find. The construct was missing a leg and both arms, and had a hole in the torso, but it was clearly humanoid in shape. It’s body was made out of an unknown metal, one that appeared to be strong and durable, but was also surprisingly light. The construct’s head was somewhat ornate, designed to look like some sort of ceremonial helmet. The faceplate was adorned with an intricate series of overlaid metalwork, forming a visor, and a plume of feather-like protrusions attached at the base of the neck. Another series of larger wing-like protrusions were attached at the back, just above the waist. They look sort of like coattails, Erik mused. The one leg that remained had an elaborate knee joint that appeared to be motorized. Impressive. Turning his attention back to the head, Erik noted that it appeared to be made of multiple plates that could be separated. Grabbing the back of the head, just above where the “feathers” were attached, Erik pulled up and away. He was met with resistance at first, but then he felt something release and the entire metal plate came off, revealing what he could only assume was the construct’s “brain:” a network of interlaced circuitry encircling crystal with hard, angular edges, glowing with a pale cyan light. Erik couldn’t help but gasp. “Incredible,” he said aloud. It was the single most advanced piece of circuitry he had ever seen in his life. A faint reddish-purple glow filled Erik’s workshop as the Maverick flew through warp space to its next destination. The Genevan man sat leaned back in his chair, stroking his large mustache as he looked at the ancient robotic construct lying on his table. Over the past week or so, Erik had been working diligently to repair it. Using the many parts recovered from the ruin, he had put it back together. He had replaced the damaged chestplate and shoulder joints, and had attached a second leg and a pair of arms, which he had wired in to the best of his ability. Of course, there was no way to know if he had been successful until he could power it up. In order to do that, however, he first needed to figure out how; there did not appear to be any obvious way of providing power to the unit. Erik let out a sigh, then stood up. It was time to get back to work. He approached his work table and looked the ancient robot over once more. “How do you work, my friend?” the engineer asked aloud. There was no obvious port or anything of the sort on the exterior, which led Erik to believe that it was designed to function for a long time without needing to charge. It also meant that the power source would be a bit harder to identify. “Let’s see here.” Erik removed the chest plate and took a look at the construct’s inner workings. There were several large components in the chest cavity, and many, many smaller ones. The unit’s power source had been pretty easy to identify; the pinkish-green crystal in the center of the chest cavity couldn’t be anything else but a power source. The problem was figuring out how to get it to resume actually providing power to the unit. This is a waste of time, he thought after several minutes. Erik had spent a lot of time examining these components, but he was still no closer to figuring out what most of them did. The design was too advanced, too different. Erik slammed his fist down on the table in frustration; he was growing impatient. That was when a thought occurred to the Genevan engineer. Drastic, but it could work, he thought. Erik reached for his Pokeball and released his Pachirisu onto the table. The small blue Pokemon let out a squeak as it emerged, and discharged a tiny burst of electricity from its cheeks. “Alright, Patch, I need you to give this thing a good jolt of electricity,” Erik told his Pokemon, pointing at the construct’s exposed chest cavity. The Pachirisu nodded, then hopped up onto the ancient robot. The Pokemon let out a loud squeal as it unleashed a powerful bolt of lighting directly into the chest cavity. The sparks began to travel along the construct’s entire form, then several sections of the body lit up, glowing a bright cyan. It’s working. Patch stopped discharging electricity and looked at the construct curiously. Suddenly, the robot’s fists clenched, causing the Pokemon to hop back in surprise. Then, the eyes flickered to life. Erik watched in awe as the construct slowly sat up and turned to look at him. Then it spoke in a surprisingly natural-sounding voice. Notes: So, here we are. The beginning of the write up of the Spacemon spinoff campaign GMed by me instead of DragonStorm! How exciting! Just a little background, I got the itch to GM again, and some of the folks here on TAY who were in the game DragonStorm GMed while Spacemon was on one of its breaks were itching to play again, so this campaign came to be. I also wanted to put more focus on storytelling than worldbuilding, so DragonStorm gave his blessing for me to GM a Spacemon spinoff. This campaign is set 40 years before the start of the original campaign and is mostly set in the Outer Rim, on the frontier of space. In this era of the Spacemon universe, this region of Space is still being explored and charted and there is still much to be discovered. This first chapter isn’t from a campaign session, but it’s something I wrote as a prologue of sorts to introduce some of the characters and set the tone for this series. I can’t take all the credit for this chapter though, the opening scene is adapted from a writing piece that one of my players, Industrial Revolutions, wrote for a writing class, taking inspiration from the campaign. I changed a lot of details to fit the narrative I had established for the campaign and the rules of the Spacemon universe, but the narrative flow is more or less the same. So, let’s take a look at who we’ve introduced in this chapter. First, we have 2 major NPCs from the campaign, Cyrus Drake and Erik Virtanen. Unlike original Spacemon, where the PCs didn’t even start with a ship, let alone one with NPC crewmates, I felt it easier to start all the PCs together on a ship with an established crew so I didn’t need to worry about getting the party together. I also added some NPC crewmates to fulfill certain roles. Captain Cyrus Drake is a means by which I could provide the party with quests and information, and he served as a great character to be the perspective character for the first scene. I definitely took a lot of inspiration from Mal Reynolds from Firefly for his character. Then Erik Virtanen served to provide crafting services to the party. Then we have a couple PCs introduced here: Axel Zuikaku, played by AxelChildOfDestiny, and Taraka Bhaluka, played by Novibear. Axel is a mercenary with a penchant for fire, and Taraka is a Sinai monk on his pilgrimage. Of course, there is still more of the cast to be revealed, so stay tuned.